For now, here are some links I found share worthy this week! How adorable is this wedding ring holder for your bedside? My hands are so dry and chapped this time of year, I slather up with lotion and wear cotton gloves to bed, so I will be making this to hold my rings! ﻿I am a traditionalist when it comes to church music, I am not a big fan of 'contemporary' music. Maybe because it's not usually done well? Or maybe it's because I think of it as 7-Eleven music- the same 7 lines, repeated 11 times? Even if you are a fan, we can't forget the beautiful hymns we grew up on. I grew up in traditional churches and played piano and organ for one for an additional 10 years, so these weekly posts dedicated to traditional hymns made me cry. ﻿I recently purchased hexagonal glitter and love all of The Nailasaurus' Glequins manis are beautiful! 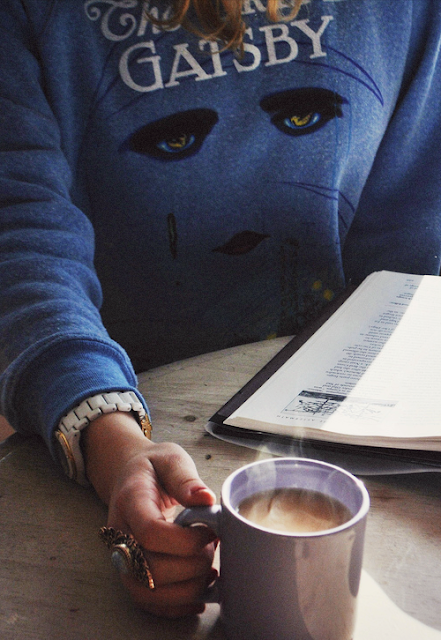 Comfy sweatshirt, cup of coffee, couch and a good book sounds delightful! Especially on this COLD day! im following you :) mind follow me back? LOVE all of the pictures of your Nails!! !The colors are beautiful! I followed you from the GFC blog hop! Hope you will follow me back!! Thanks so much! That sweater seems so cute. That Gatsby sweatshirt is TO DIE FOR! I'm in love with it!